The following research is grouped by topic. This paper provides a​ single-column modeling approach to study the interaction between convection and large-scale dynamics. 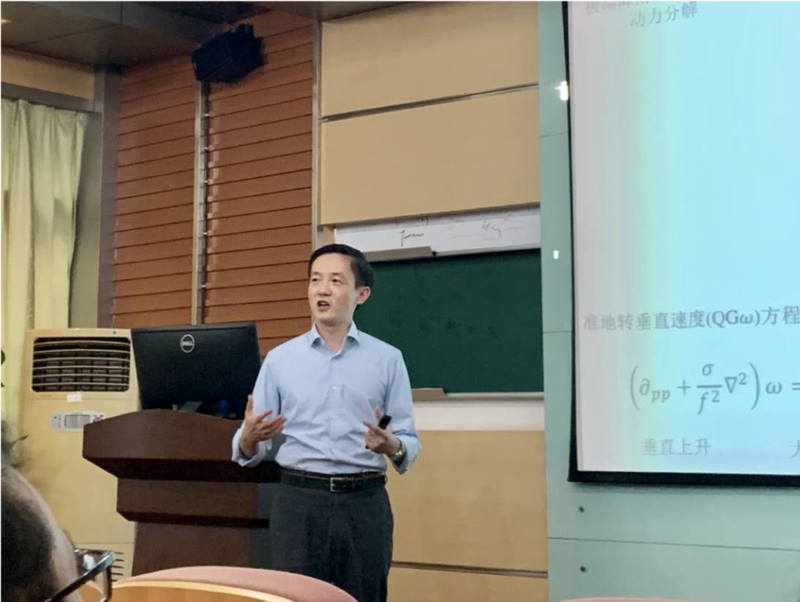 It is called the Column Quasi-Geostrophic (CQG) method because we use the quasi-Geostrophic dynamics to parameterize the responses of large-scale dynamics to convective anomalies. This framework could allow us to attri- bute the precipitation of strong rainfall events to dif- ferent large-scale forcings and the resulting convective feedback. Another potential application is to help understand the structure of convection in organized convective systems, such as monsoon depressions. The CQG framework can also serve as a test bed for improving convective parameterizations. Extratropical extreme precipitation events are usually associated with large-scale flow disturbances, strong ascent, and large latent heat release. The causal relationships between these factors are often not obvious, however, the roles of different physical processes in producing the extreme precipitation event can be difficult to disentangle. Here we examine the large-scale forcings and convective heating feedback in the 2010 Pakistan precipitation events within the Column Quasi-Geostrophic framework. Numerical results show that the positive feedback of convective heating to large-scale dynamics is essential in amplifying the precipitation intensity to the observed values. Orographic lifting is the most important dynamic forcing in both events, while differential potential vorticity advection also contributes to the triggering of the first event. Horizontal moisture advection modulates the extreme events mainly by setting the environmental humidity, which modulates the amplitude of the convection’s response to the dynamic forcings. ​Nie and Sobel: Responses of tropical deep convection to the QBO: cloud-resolving simulations, JAS, 2015. ​Observational studies suggest that the stratospheric quasi-biennial oscillation (QBO) can modulate tropical deep convection. The authors use a cloud-resolving model with a limited domain, representing a convective column in the tropics, to study the mechanisms of this modulation. The large-scale circulation is parame- terized using the weak temperature gradient (WTG) approximation. Temperature variations typically seen in easterly and westerly phases are imposed in the upper troposphere and lower stratosphere of this reference profile. The equilibrium precipitation rate shows slight increases in response to a QBO easterly phase temperature perturbation over small SST anomalies and strong decreases over large SST anomalies, and vice versa for the QBO westerly phase perturbation. A column moist static energy budget analysis reveals that the QBO modulates the convective precipitation through two pathways: it changes the high-cloud properties and thus the column radiative cooling, and it alters the shape of the large-scale vertical motion and thus the efficiency of energy transport by the large-scale flow. Nie, Boos and Kuang: Observational Evaluation of a Convective Quasi-Equilibrium View of Monsoons, JC, 2010. Idealized dynamical theories that employ a convective quasi-equilibrium (QE) treatment for the diabatic effects of moist convection have been used to explain the location, intensity, and intraseasonal evolution of monsoons. This paper examines whether observations of the earth’s regional monsoons are consistent with the assumption of QE. It is shown here that in local summer climatologies based on reanalysis data, maxima of free-tropospheric temperature are, indeed, nearly collocated with maxima of subcloud equivalent potential temperature, in all monsoon regions except the North and South American monsoons. Free-tropospheric temperatures over North Africa also exhibit a strong remote influence from the South Asian monsoon. Vertical structures of temperature and wind reveal two types of monsoon circulations. One is the deep, moist baroclinic circulation clearly seen in the South Asian monsoon. The other is of mixed type, with the deep moist circulation superimposed on a shallow dry circulation closely associated with boundary layer temperature gradients. ​Nie and Kuang: Beyond bulk entrainment and detrainment rates: a new framework for diagnosing mixing in cumulus convection, GRL, 2012. ​A new framework for diagnosing mixing in cumulus convection is proposed, where the vertical evolution of the cloud mass flux distribution as a function of given parcel properties is viewed as a mapping process. Matrices that characterize this mapping process are constructed using a Lagrangian particle dispersion model embedded in a Large Eddy Simulation. Extending previous use of LES-diagnosed bulk entrainment and detrainment rates to test bulk plume models, the construction of these mapping matrices from LES provides a reference, against which multiple-parcel models can be compared. The framework is further applied to diagnose the response of shallow cumuli to a small tem- perature perturbation. Nie and Kuang: Responses of shallow cumulus convection to large-scale temperature and moisture perturbations: a comparison of large-eddy simulations and a convective parameterization based on stochastically entraining parcels, JAS, 2012. ​Responses of shallow cumuli to large-scale temperature/moisture perturbations are examined through diagnostics of large-eddy simulations (LESs) and a stochastic parcel model. The parcel model reproduces most of the changes in the LES-simulated cloudy updraft statistics in response to the perturbations. Analyses of parcel histories show that a positive temperature perturbation forms a buoyancy barrier, which preferentially eliminates parcels that start with lower equivalent potential temperature or have experienced heavy entrainment. Besides the amount of entrainment, the height at which parcels entrain is also important in determining their fate. Stochastic entrainment is key for the parcel model to reproduce the LES results. The second part of the paper further explores the feasibility of a stochastic parcel–based cumulus parameterization. Nie, Kuang, Jacob and Guo: Representing effects of aqueous phase reactions in shallow cumuli in global models, JGR, 2016. ​Aqueous phase reactions are important, sometimes dominant (e.g., for SO2), pathways for the oxidation of air pollutants at the local and/or global scale. In many current chemical transport models (CTMs), the transport and aqueous reactions of chemical species are treated as split processes, and the subgrid-scale heterogeneity between cloudy and environmental air is not considered. Here using large eddy simulation (LES) with idealized aqueous reactions mimicking the oxidation of surface-originated SO2 by H2O2 in shallow cumuli, we show that the eddy diffusivity mass flux (EDMF) approach with a bulk plume can represent those processes quite well when entrainment/detrainment rates and eddy diffusivity are diagnosed using a conservative thermodynamic variable such as total water content. Experiments with various reaction rate constants and relative abundances of SO2 and H2O2 indicate that when the reaction timescale approaches the in-cloud residence time of air parcels, the errors of the bulk plume approach start to increase. Treating chemical tracer transport and aqueous reaction as split processes leads to significant errors, especially when the reaction is fast compared to the in-cloud residence time.